With their light texture, Setacolor colours for light fabrics have minimum effect on the flexibility and fineness of fabrics. 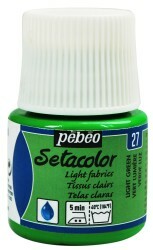 Water-based, ready-to-use, intense and concentrated, they can be used neat or diluted with water for watercolour effects. These paints can also be used for sunprinting, diluted with water and laid out in the sun while wet with objects on top to make a design.